While trying the MS Office 2010 beta version, I came across the strange problem. 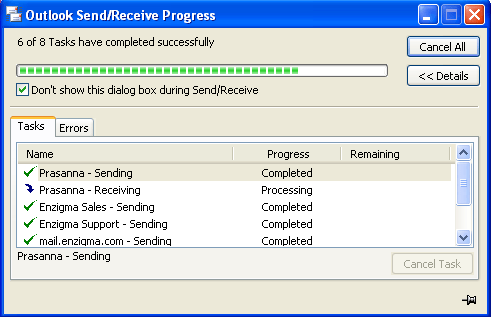 Send/ receive was not working after it imported the settings from Outlook 03. It was very difficult to trace why it was not working, as it carries on processing and process never stops. My problem got resolved when I killed OUTLOOK.EXE from task manager and exited those send a smile/frown from the tray. And yuppie !!! problem was resolved. Office 2010 Professional Beta is now available for free download! It seems that the success of the Windows 7 Beta has led Microsoft to believe that this is the perfect way to go forward with all new major software releases. We, for one, won&rsquo;t be complaining as the company has just rolled out a free download of the beta version of Microsoft Office 2010 Professional. Author PrasannaPosted on November 22, 2009 Categories UncategorizedTags beta, download, MS office 20102 Comments on Office 2010 Professional Beta is now available for free download!